In his 1891 address before the Yale Philosophical Club William James pondered the origins of our "moral perceptions" and concluded that some are likely "brain-born" and that their violation elicits an autonomic sense of revulsion in us. He uses as an illustration the scheme above in which one "certain lost soul" is forced to suffer so that, somehow, the rest of humanity might live lives of unimagined happiness. Of course the notion of the scapegoat, traditionally one punished to purchase the redemption of a community of believers, was not new with James. 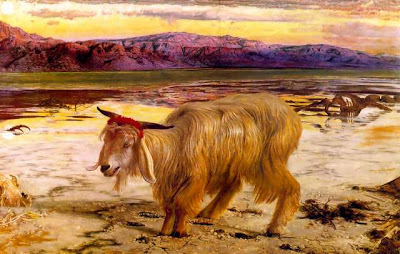 The scapegoat ritual described in Leviticus has been our prototype for centuries, but the practice of animal and human sacrifice in any one of a number of ancient cultures could serve just as well as an example. What James has done in his taut rendition is to both universalize the scapegoat bargain and simultaneously magnify its moral dimension. The benefits are not restricted to the members of a particular religious group, but extend to all mankind. And the price paid by the victim is not a quick and certain death but a life of unending torture. James was not the first modern writer to confront the essential moral questions raised by the scapegoat bargain. In his novel, The Brothers Karamazov, published 10 years before James's Yale address, Fyodor Dostoyevsky explores a similar arrangement in a passage concerning the parable of the Grand Inquisitor. Imagine that you are creating a fabric of human destiny with the object of making men happy in the end, giving them peace and rest at last, but that it was essential and inevitable to torture to death only one tiny creature ... and to found that edifice on its unavenged tears, would you consent to be the architect on those conditions? Although these ancient and contemporary conceptions of the scapegoat bargain differ in many respects, they are similar in that they are all metaphysical in nature. In other words, there is no physical mechanism that connects the suffering of the selected victim with the benefits others derive. In the Old Testament the connection is presumed to originate as part of the covenant between God and his chosen people. In Karamazov it emerges, by fiat, from the very "fabric of human destiny". Nonetheless, the question could be posed: Might it be possible to reformulate this metaphysical arrangement in plausibly realistic terms? With his science fiction film, Moon, writer-director Duncan Jones has done just this. The utopia of the near-future world that Jones imagines in Moon is, unlike its 19th-century forerunners, not one predicated on the possibility of human moral perfectibility. 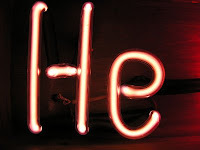 Instead it is founded concretely upon the availability of an inexhaustible source of clean energy, an isotope of the element helium, He3, which is used to fuel thermonuclear reactors across the face of the globe. In Moon, limitless, inexpensive, carbon-free electrical power has, it appears, eliminated the contention for resources that has historically been the root of human conflict and, in turn, ushered in a golden age of plenty, for rich and poor nations alike. Troubling moral complications arise in this brave new energy-rich world because, it turns out, precious He3 must be scraped from the surface of the far-side of the Moon - James's "far-off edge of things" - by means of a vast mining operation which, in spite of advances in technology, is not entirely automated. This exquisitely engineered, thoroughly computerized He3 factory has one flaw, and that flaw is that it requires the services of a single human being to keep the extraction bulldozers running smoothly and thus insure an uninterrupted flow of utopia-sustaining fuel to planet Earth, a quarter of a million miles away. For Moon this lone individual - James's "certain lost soul" - is astronaut Sam Bell, who, when he is introduced to us, is desperate to soon conclude his 3-year tour of duty on this lonely lunar outpost. At first glance Sam, dispirited and disheveled, strikes us more like a beaten-down refugee than a right-stuff-bearing spaceman. Separation from his wife and young daughter, not to mention utter isolation from other members of his species has taken an enormous emotional toll on Sam. We pause to wonder how any "modern" corporation could be so morally bankrupt as to contract for the kind of labor that would result, inevitably, in such severe psychological decline. Little do we know that the crimes inflicted by his employer on Sam - and, shall we say, others very much like him - are far worse than we even dare to imagine. As the startling moral transgressions that underlie the scapegoat bargain in Moon are revealed, we come to appreciate how masterfully Jones and screenwriter Nathan Parker have taken the metaphysical problem outlined by James and Dostoyevsky and created a convincingly naturalist realization. Not only does Moon succeed in its own right - as a character study and as a suspense-thriller - it also succeeds as an exemplary work of science fiction in that it grabs hold of a profound, but abstract, philosophical question and recasts it as a flesh-and-blood human tale, brought to life by plausible speculation that ventures just beyond the limits defined by our current scientific capabilities. * See this blog post, The Scapegoat in Fyodor Dostoyevsky, Ursula K. Le Guin, and William James?, by Horace Jeffery Hodges for an insightful discussion of the treatments by these three authors. I sure had a thought arise whilst reading this: The thought of animals used in laboratories for medical (or even cosmetic) testing; the thought of animals leading lives of great suffering for the benefit of the food industry. Eating the tortured flesh of these poor souls brings lots of pleasure to many (most) humans who don't even give it a second thought. Or do non-human sentient beings not count? I agree entirely: non-human sentient beings count! They are tortured and killed gratuitously for our minor pleasures, as you said, without most of us giving them a second thought - or a first thought, for that matter. Thanks for sharing your insight. It serves to even further universalize the concept of the scapegoat bargain and show how readily we shelter ourselves from the suffering of others. The irony is that one can pose such a tale as a moral dilemma. We each make such decisions in an immoral manner dozens of time a day without any qualms. But there is such a cascade of circuitous links and chance outcomes between our each action and the "distant" consequence that we can take comfort in never knowing the specific outcome of each choice. Consider: would you allocate $500k to save a single suffering child who you know...or would you allocate it to build a blood bank, which you statistically knew would save 5 children over the next 5 years...none of whom you would ever be able to identify. In Moon, does the astronaut volunteer for the job? In the movie is sounds like his bosses were deceiving him but what if they were not and the choice was totally up to the astronaut. This seems like it would be an even more vexing moral dilemma, both for the astronaut and those who benefit from his sacrifice. Without answering your question in detail - so as not to spoil the movie - the astronaut in Moon, Sam Bell, is the victim of a rather remarkable deception. I agree, the difference between willing and unwilling sacrifice is an important one. Scapegoats have no choice with regard to their suffering. Martyrs (for lack of a better word) offer their suffering willingly. In this taxonomy, Jesus would be considered a martyr, but not a scapegoat. The fact that benefit might be derived from either type of sacrifice is morally troubling, but I'm not sure that one is *obviously* more vexing than the other. Many believers, far from being outraged by Jesus' sacrifice, not only accept it, but, indeed, celebrate it. Others find such martyrdom repugnant. Christopher Hitchens ("God is Not Great") writes about what he feels to be the benighted notion that anyone, even willingly, could take responsibility for the sins of others. Suffice it to say, for this essay, my aim was to admire how good science fiction could create a plausible realization of the metaphysical scapegoat bargain, and not so much compare it with similar moral conundrums. I found your essay very insightful. Though, I wonder to what degree the director was aware his story fit the scapegoat archetype. In other words, did he start with this plot construct and then shape the story around it, or did it come about by accident (or perhaps it was ``in the air'', subconscious)? Having looked at some interviews with the director on the internet (few of which asked probing questions about the plot -- most questions concerned technical details like special effects), I would think perhaps the latter is closer to the truth. There is a really great quote I came across once by Mark Twain, which unfortunately I couldn't track down, and which is relevant here. Roughly, the quote is about Twain's surprise upon reading a literary critic write about a story of his, in which the critic discusses all sorts of hidden meanings and influences, none of which Twain said he was aware of. Although I do research when I write these things, I try to not to venture too far in the direction of finding confirmation for the central ideas that I hope to call my own. It's the best I can do to maintain an intellectual "cleanroom" of sorts and not worry so much about borrowing from others unintentionally. Immediately upon finishing, though, I tried to track down an address for Mr. Jones and, failing in that, I wrote an email to one of his production companies, Liberty Films, sharing my gratitude for his movie, as well as a link to my blog post about it, and asking them to kindly pass them along to the director. I haven't heard a word back from Liberty Films or from Duncan. Now it doesn't surprise me in the least that the press coverage of Moon and the interviews with Mr. Jones don't discuss scapegoat bargains and such. I suspect that references to William James and to The Brothers Karamazov are high on this list of things for directors not to mention when on tour promoting newly-released science-fiction movies. Yet I agree with you, the chances are at best modest that Jones had the moral question of the scapegoat explicitly in mind when he wrote Moon. What is more likely, as you suggested, is that it was a widely available motif which he chose to exploit, without knowledge of its history or literary antecedents. That said, the formal similarity between the premise of the movie and the William James quote that opens my essay is uncanny, or at least I find it so. Likewise with the moral conundrum posed in Karamazov. Suffice it to say that Jones with Moon has concocted a scenario in which the existence a globe-spanning utopia is predicated on the unending torture of one isolated and unsung human being, and that he has done so without recourse to metaphysical causation, but using a plausibly realistic explanation. Even though Duncan Jones might not have intended his movie to be a non-metaphysical realization of the scapegoat bargain, that is, in fact, what it is. I'd like to see whether he would argue with that claim. As always, thanks for your comments and ongoing encouragement. actually, this movie made me think immediately of Iraq and Afghanistan, and the endless tours of duty that service men and women have been asked to do in the name of 'energy security'. it's not a hypothetical situation, it is a reality. in order to maintain our current standard of living, people must suffer on the other side of the world. perhaps even more so, military personnel often perceive themselves, like Sam, as just doing a job in order to support their family and protect their country - perhaps without fully grasping the layers of political intrigue which place them in mortal danger for the purpose of enriching large corporations such as Halliburton.